San Diego Comic-Con 2017 has wrapped up, but the news is still rolling in. Let's take a minute and reflect on the great moments that can only happen at this gigantic festival of pop culture. The Comic Con of San Diego reopened its doors in a new edition, the 2017, starring the latest in such popular companies as Marvel, DC or Netflix, who take advantage of such a multitudinous event to present their next developments, whether video games, Comics, series or movies. In this occasion they announced novelties of weight of video game industry as the presence of Spider-Man in Marvel Vs. Capcom Infinite (along with other characters like Haggar, Frank West or Nemesis) or the Call of Duty WWII Zombie Mode trailer, as well as exclusive material from such films as “Justice League”, “Ready Player One” or “Blade Runner” 2049 (With the confirmation of Spawn’s film reboot) or series like “The Walking Dead”, “Stranger Things”, “The Defenders”, “Game of Thrones” or “Fear The Walking Dead” among many other works. The Comic-Con has always been characterized by a public as delivered as multifaceted that fills the different stands of the fair with events, contests, demonstrations or a continuous parade of cosplays of all kinds. Actors such as Sophie Turner (Sansa Stark), Gwendoline Christie (Brienne de Tarth), Alfie Allen (Theon Greyjoy), Liam Cunningham (Davos Seaworth) and John Bradley (Samwell Tarly) debuted a short video with excerpts from upcoming episodes. In this clip saw the kingdoms plotting alliances before what seems an inevitable war. The HBO series had its highly anticipated presentation at Hall H, the largest showroom in the San Diego Convention Center that houses about 6,500 people. More than six thousand fans of the Marvel Comics universe were able to witness the progress of their upcoming film projects. The high note in the Comic-Con was carried ‘Avengers: Infinity War’, when it was projected a montage with scenes of the film to be released in May of 2018. The characters of ‘Guardians of the Galaxy’, led by actor Chris Pratt, could be seen furrowing the screens and bumping into one of the Avengers. The mere encounter unleashed madness and applause in Hall H of the Convention Center. Then the presence of Spider-Man played by Tom Holland and wearing his space suit – which dazzles in his recent movie on the board Spider-Man: Back to Home – also caused cheers from fans. The presence of some Avengers on stage, such as Chris Hemsworth (Thor), Mark Ruffalo (Hulk) and Chadwick Boseman (Black Panther), finished energizing the showroom. The final trailer for the sequel “Thor: Ragnarok”, which premiered in November 2017, was revealed. The images highlight an interstellar lawsuit and the return of the family’s black sheep, Loki (Tom Hiddleston). Oscar winner Cate Blanchett is the villain Hela and the ever-friendly Jeff Goldblum – the late ‘Independence Day’ and ‘Jurassic Park’ – stars as the Grandmaster. New posters of ‘Thor: Ragnarok’ and the upcoming release in February 2018, were also revealed. It transpired that three-time Oscar nominee Michelle Pfeiffer will be the newest member of the ranks of “Ant-Man,” whose film “Ant-Man and the Wasp” will be released in July 2018. The actress who made a name In the adaptations of the comic to the cinema, incarnating to Catwoman, will now be the heroine Janet van Dyne, alias The Wasp (The Wasp). Netflix supernatural thriller actors, “Stranger Things,” were greeted as heroes at the San Diego annual comic book convention, revealing new plot details and second season footage. The breakthrough is replete with references to the 1980s, from the Dragon’s Lair video game to Michael Jackson’s hit Thriller, which accompanies the images. Attendees received a surprise as the first question from fans was made by actress Shannon Purser, who plays Barb Holland, one of the favorite characters of the public but short lived and for which he earned an Emmy nomination. 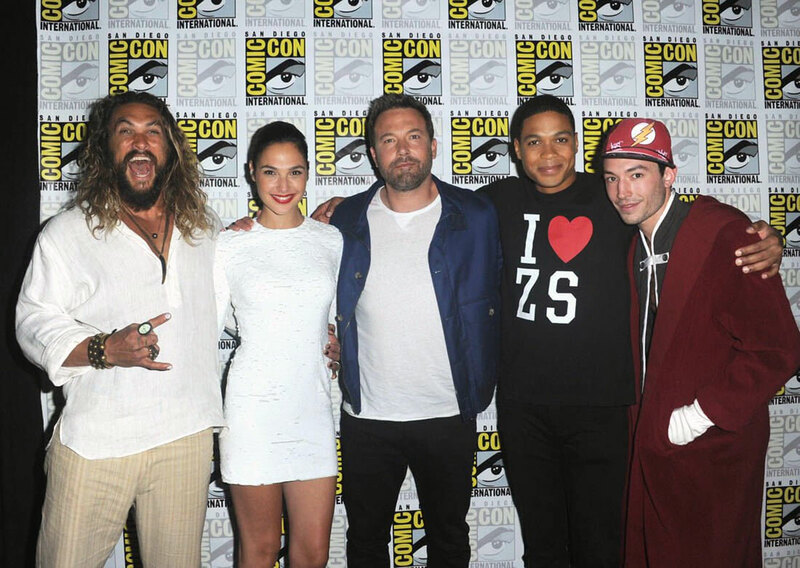 Named as one of the most anticipated acts in this Comic-Con, Warner Bros. did not disappoint its fans by showing the first trailer for Spielberg’s Ready Player One along with a spectacular new Justice League preview and, on the other hand, confirmed The secret secret that Wonder Woman will have a sequel. The film will premiere next November 17. Affleck addressed the controversy over his departure as director of The Batman, the solo film about the bat-man he himself will star in, but who will ultimately direct Matt Reeves (War of the Planet of the Apes, 2017). Who was sparked with applause was Steven Spielberg, the legendary director who had the first video of his science fiction film “Ready Player One” under his arm. The plot of this feature film, based on the novel by Ernest Cline and to be released in March of next year, travels until 2045 and explores a society completely delivered to the virtual reality Oasis. Spielberg pointed out that with Cline’s novel he traveled back in time to a decade he loves, the 80s, but also moved to a future that, in his view, is not so far. AMC has introduced the first trailer for the eighth season of “The Walking Dead,” and the prints leave behind everything seen so far in the series. The images start with epic, terrifying scenes between Negan and Gabriel, in a dark tone that will mark, even more, the story. The present has never painted excessively well for Rick and company, but as seen in the trailer, it is sure to complicate the situation much more. The rebellion against Negan promises to be devastating. Wonder Woman returned to San Diego Comic-Con, presumably to take several victory laps. Let’s go through the highlights and best news from Comic-Con 2017.